P. D. Lochridge, Brigadier General, United States Army, was born near Bexar, Alabama, December 2, 1863. He was a student at Mississippi State College, 1880-83 and then graduated from the United States Military Academy in 1887, and from the Infantry and Cavalry School in 1893. He married Carlotta Rawolle, February 20, 1889, and they had one son, Rawolle. Lochridge was commissioned Second Lieutenant, Cavalry, June 12, 1887, and advanced through the grades to Colonel on July 1, 1916. He was appointed Brigadier General, National Army, December 17, 1917. He retired for disability in line of duty, November 10, 1919. He was advanced to Brigadier General on the retired list, June 21, 1930. He served in the West, in Cuba, in Puerto Rico, in the Philippines, on the Mexican Border, and in France. He was a member of the General Staff of the United States Army, 1915-19. He was Paymaster of the Cuban Census and in charge of engineering enterprises, 1899-1900. Foloowing his retirment, he was Treasurer and Director, Marx and Rawolle Shellac, New York City and Montreal, 1920-26. He was an organizer of Calcutta Traders, Ltd., 1921, which maintained shellac factories at Purulia and Mizapur, India, 1922. His medals included the Distinguished Service Medal, Spanish-AMerican War Medal, the Cuban Occupation and Puerto Rican Occupation Medals and World War I Victory Medal, he was a Commander of the French Legion of Honor, Companion of the British Order of the Bath, Commander of the Order of the Italian Crown, a recipient of the Italian War Cross. He made his home in Washington, D.C. and died: there June 17, 1935. He was buried with full military honors in Section 2, of Arlington National Cemetery. 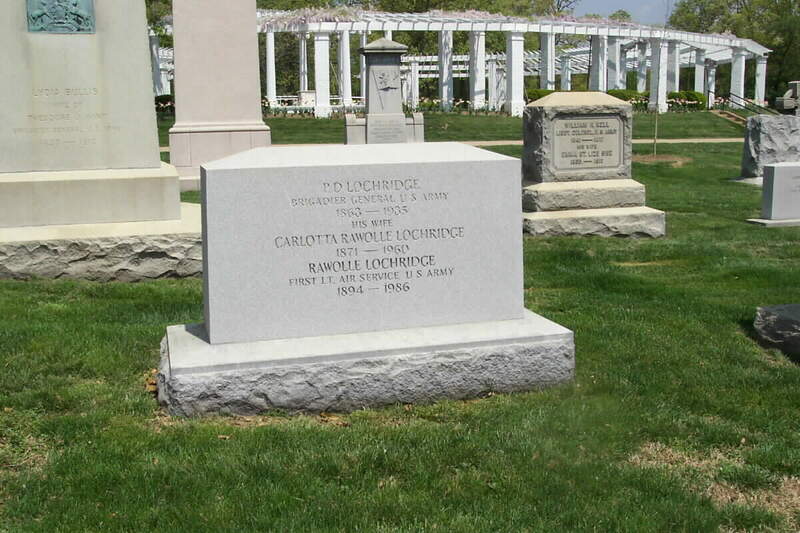 Buried with him are Carlotta Rawolle Lochridge, his wife, 1871-1960, and his son, Rawolle Lochridge, First Lieutenant, United States Army Air Service, 1894-1986.